This trail mix recipe will definitely give you energy, whether actually on a trail or snacking on the go. 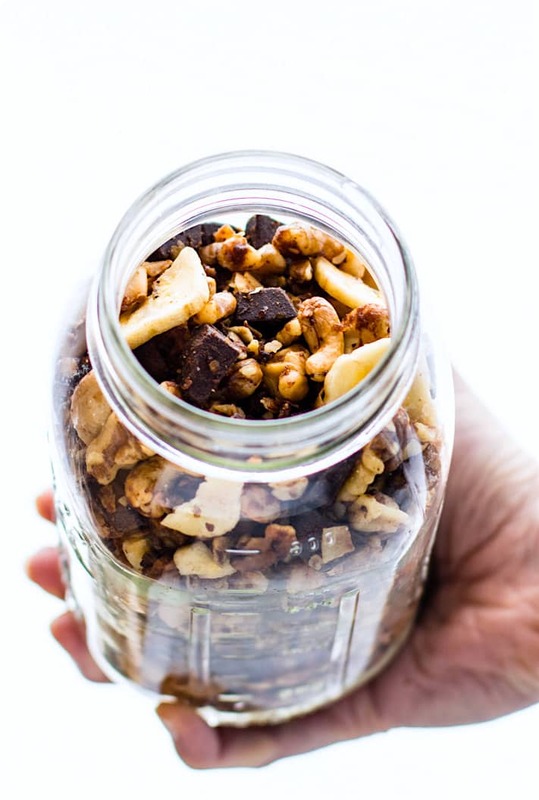 A gluten-free and paleo trail mix that you can make easily in a slow cooker! The mixed nuts, coconut sugar, coconut flakes, and butter all toast perfectly in the crock pot, creating a nutty sweet taste. Dark chocolate chips and banana chips are stirred in to finish off this delicious treat! 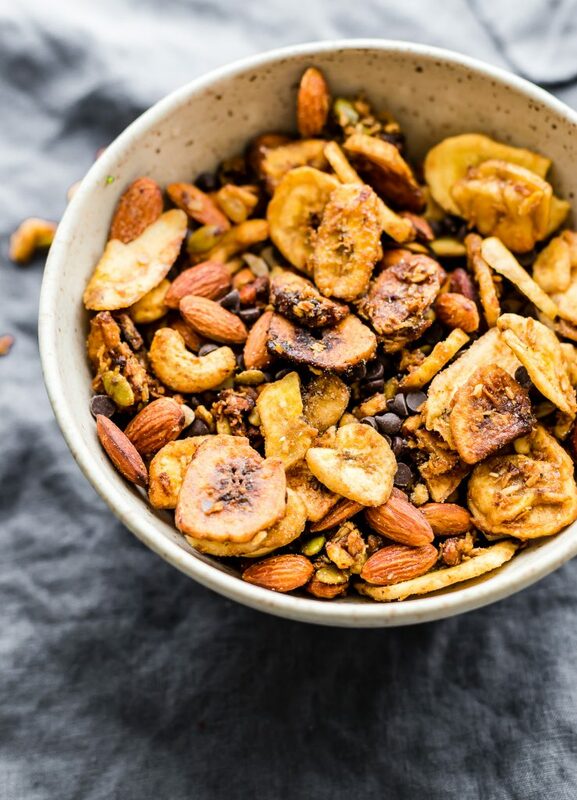 Make a big batch of Crock Pot Chunky Monkey Paleo Trail Mix and enjoy. Well, friends, I don’t have any super duper nutrition tips or trend talk today. Will you miss it? Nah, I think all our brains work slower on Friday and Holiday weekends anyway. Oh summer, it wears me out and makes me hungry. Haha! But that’s okay, my need for a new “season” will restore that, along with some good FUEL. Did you know they call July the month of snacking?! 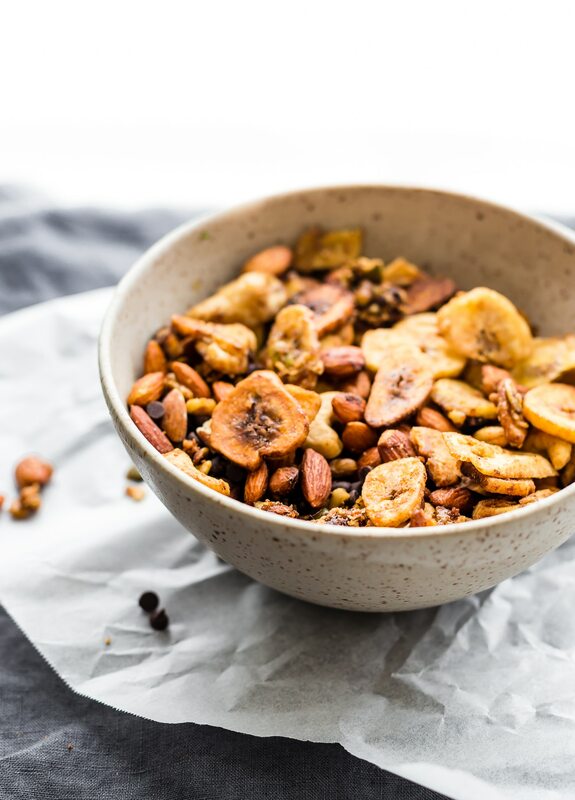 Hence this EASY PEASY chunky monkey paleo trail mix recipe. Yep, trail mix. The food you eat on the “trail” of life. Haha! Road trips, long flights (or flight mishaps), layovers, outdoor adventures, picnics, BBQ, fun in the sun all day, etc. Like whoa! FUEL me up with some major snackage for July! Snackage. It’s my new favorite word. And it goes perfectly with words like chunky monkey, wouldn’t you agree? Now I have you thinking about Ben and Jerry’s ice cream or ice cream in general, don’t I? That is definitely where my inspiration for this paleo trail mix recipe comes from. That and my love for gluten-free crock pot, no-bake snacks, and well… you get my point. Watch this quick video and you’ll get a healthy chunky monkey trail mix addiction! What does Chunky Monkey mean, anyway? Come to think of it, does anybody really know where the name chunky monkey really came from? Nope, not Ben and Jerry. It was actually a cartoon character in 1973. You’ve found Chunky Monkey’s home base at the Silly Zoo! Yes, you’re welcome. I just quoted magical poetry for you on a Friday! Simple. All you need are a few real food ingredients to help make it naturally sweet. See, this crunchy trail mix is even vegan-friendly, because that’s how chunky monkey rolls! Did I mention it’s soooo amazing and smells unreal when you make it in a crock pot (slow cooker)? Yes, it is! We gobbled up this Paleo trail mix during travel, work, and everything in between! It’s one of those handy dandy snacks that pretty much satisfies every craving. 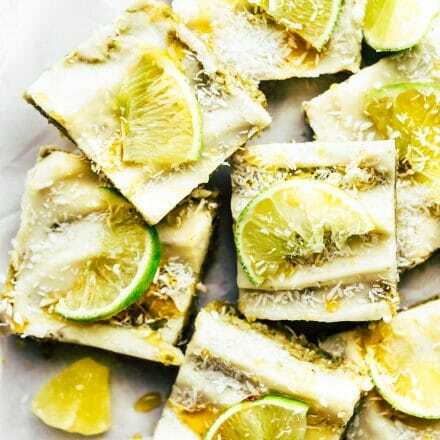 Crunchy, sweet but also not too sweet. 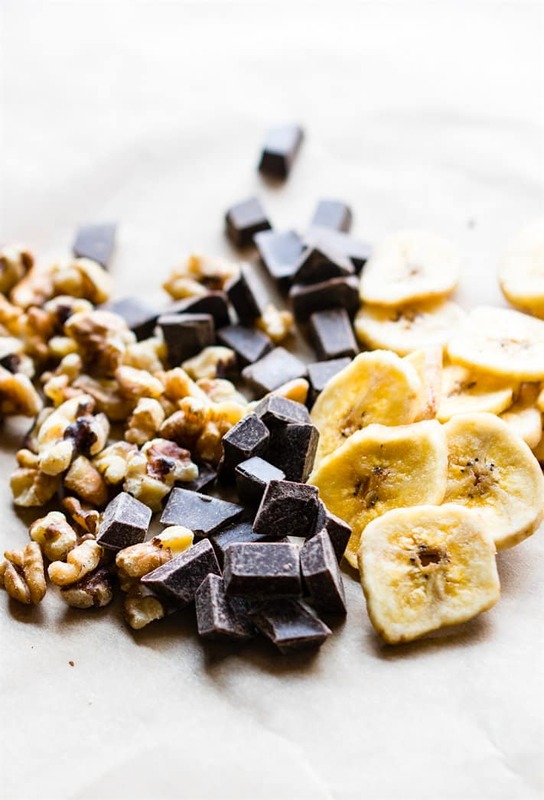 Healthy fats to nourish, tons of potassium from the bananas, antioxidants in the dark chocolate, and well.. the perfect “snackage” for kids and adults alike! Speaking of kid-friendly, Chunky Monkey recipes definitely are! 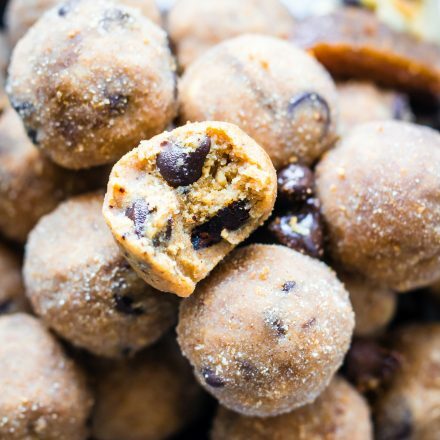 Make these Chocolate Chunky Monkey Cookies from Go Dairy Free next! Gluten free, nut free, AMAZING, right?! Enjoy this paleo trail mix recipe! Cook Time: 1 hr, 30 min. This trail mix recipe will definitely give you energy, whether actually on a trail or snacking on the go. A gluten-free and paleo trail mix that you can make easily in a slow cooker! 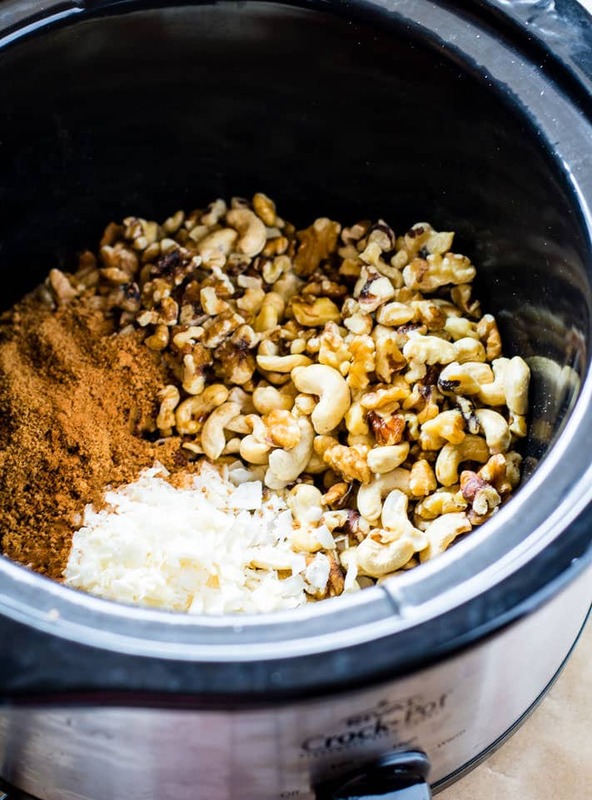 Place your nuts, coconut, sugar, vanilla, and butter slices or coconut oil in a crock pot. Mix together and place on high for 45- 60 minutes. Stir a few times checking to make sure coconut flakes do not burn. NOTE -Reduce to low after 45 minutes if flakes are cooking faster or browning. Turn to low and continue cooking for 20-30 minutes. Remove and place crock pot contents on parchment paper to dry out. Be sure to let it cool for at least 15 minutes before adding the chocolate and banana chips. Add in the banana chips and chocolate chips and mix together. OPTION – cooking banana chips – You can add in your unsweetened banana chips to cook with the nuts/coconut, instead of adding later. But you will need to stir often and cook only 45 minutes. for vegans – If you are using coconut oil, use 3 tbsp to start and then adjust halfway to make sure all ingredients dissolve. You might need more or less. 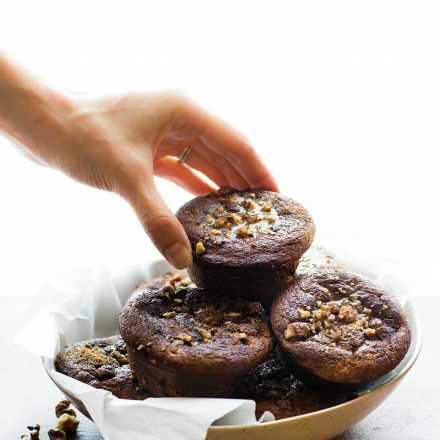 To lighten up the sugar/calories, use Stevia baking sugar and 1/2 cup of dark chocolate. In all seriousness, if Chunky Monkey had my chunky monkey crock pot Paleo trail mix, I think he would have to change his name to lean machine monkey. Hint Hint.. you can add in almonds instead of cashews and cook your banana chips if desired. See recipe notes! It’s so delish! Now I’ll hand you some with my chunky monkey hands. Okay, those are my husband’s cute hands, not chunky. More like hunky. I’ll leave you with that. Corny Cotter moment. Grab a bag and let’s fill it up. It’s going to be a snackin summer ya’ll! Is your favorite trail mix recipe paleo or regular trail mix? Have you ever made trail mix in a crockpot before? Have a wonderful Independence Day Holiday weekend friends! 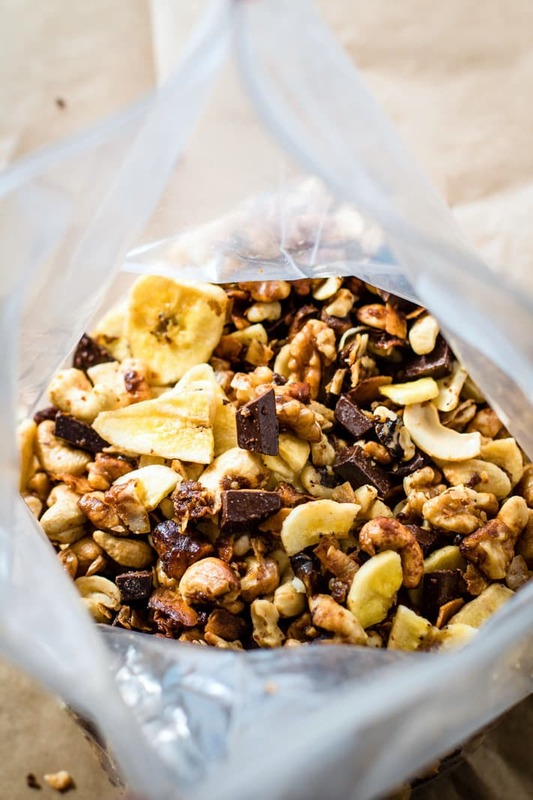 Crock Pot Chunky Monkey #Paleo Trail Mix Recipe! Such an Easy and Delicious #snack for Summer! KEEP ME POSTED ON YOU! LET’S STAY CONNECTED. I’m on FACEBOOK, INSTAGRAM, PINTEREST, and TWITTER. ← Do You Need a Season of Self Investment? A snack like this made in the crock pot is genius and chunky monkey is my favorite. Maybe it’s everyone’s favorite! My crockpot will need to be dusted off to try this. Not enough use lately. Hi! How much is a serving ? Thanks! about 1/3 cup or so. This looks amazing and I love that you can make it in the crockpot!! I’ve never made a trail mix in a slow cooker before. That’s just genius. I love chunky monkey anything (mind blown about it being a cartoon character!) so this is definitely up my alley. Would this work with the softer dried banana coins? I prefer them over the crunchy banana chips so already have them on-hand. Well isn’t this fun! Crockpot loving AND I LOVE chunky monkey things! How did I not know you can make trail mix in the crock pot?! This must happen very soon. HAnd that over!!!!!!! 🙂 Have a wonderful weekend! I never would have thought to make this in the crock pot. Genius. And then add this to coconut milk for ice cream base! I’ve never done a crock-pot snack mix, but this sounds SO delicious. I’m totally giving it a try! oh Ellen! You will love this. Snack heaven! If bananas are involved, so am I.
I had no idea Chunky Monkey came from an overweight sad monkey at the zoo. Poor fella. Using the Crockpot = Genius idea. I love the fact you can make this in the slow cooker! I rely on it weekly to make meal prep so much easier. OMG, Arman of thebigmansworld made me a batch of protein chunky monkey granola, and I’m almost out of it! NOOOO! I’ll have to remake it sometime, and I’ll definitely turn to this recipe when I run out of it! Trail mix made in the slow cooker!?! You are seriously too clever! What an awesome idea! I’m looking for a replacement for the bananas. My husband is really allergic to them. Any suggestions? We tried with dried pineapple. WIN! I made this tonight and I think I did something wrong. I added all of the crockpot ingredients in (using coconut oil) but at the end the coconut sugar and coconut flakes were still there. Was it suppose to dissolve and stick to the nuts? It’s is a whole bunch of crumbs surrounding the other stuff. Where did I go wrong? Thanks! Oh no! So sorry. Did you stir it up a few times during cooking? And poured the coconut oil evenly around everything? What temp did you place it on and for how long. I did stir it about 5 times on high heat for 45 min and then low for around 20 minutes with about 2.5 T of coconut oil. Is the sugar and coconut flakes suppose to dissolve? Do you think it would work replacing the coconut,sugar with maple syrup? you could definitely try. It might be a little stickier. Keep me posted! could this be baked in oven? If so. at what temperature and other instructions, if needed. Just made this, well a version of it. Instead of walnuts and cashews, I used pumpkin seeds and sunflower seeds. I had no coconut sugar, so I used stevia in the raw. I also added a boot of sea salt. And at the end added prunes instead of banana chips because that is what I had. It was amazing!!!!! Thanks a bunch. Not a boot… a pinch. This looks amazing! However I’m allergic to coconut any recommendations for a substitute? I’m one of those strange people that gets headaches from coconut sugar. Can you suggest a substitute or should I forge ahead without sugar? Can you have raw sugar or brown sugar? it’s refined but would work! I think, this might be suited for snack, love to have in evening! Okay! This is absolutely delicious! What a great recipe. Thank you so much for sharing. I can’t wait to try more from this site. I am in love with this recipe and have made a batch every Sunday for a month. decided to add cranberry and pineapple last week. Perfection! Next week i plan on a small batch with coffee grounds, for some added kick! Oh yay! I gotta try it with pineapple next! YUM! Delicious! I mixed in the chocolate and bananas right after I put the mix on the parchment paper. The chocolate melted all over the mix. It was an accident. How long do I let the mix cool before I add the chocolate and bananas? Thank you. Oh no, sorry it melted. Yes, I would wait at least 15 minutes until it cools. I will update the recipe notes. Thank you! I just made this. It smells great. I was adding up the ingredients, and mine only slightly differed from the brands you mention. Yet my calculations make it 533 calories for 1 tenth of the recipe. I’ve crunched the numbers a bunch of times and come to the same number 🙁 Not sure I will eat this that often. Oh wow! That’s a big difference. Let me recalculate and send the info. Stay tuned!! 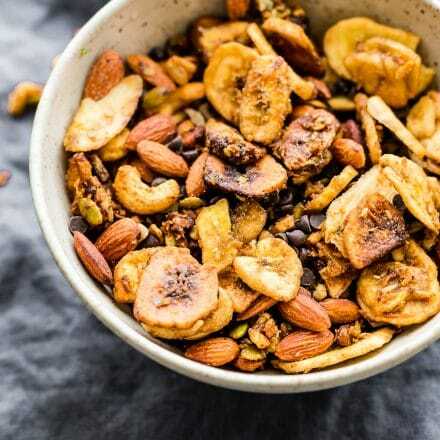 so glad to have found this recipe, it was just featured on foodiecrush, every trail mix I see in the store is not at all paleo, so thank you for this recipe! I’m so glad! I just made another batch today. Hope you enjoy it! I just got done making this and it’s fantastic. I forgot to add the coconut sugar, so I dumped it in when I was mixing in the chocolate and banana chips. No big deal – that means I didn’t give it time to stick to everything, but so what? I will eat it with a spoon – it still tastes great. 🙂 The main reason I made this is that I was looking for something different to do with my bananas, so I made my own banana chips and used those in the mix. I also added some raisins because I had them lying around. Other than the raisins and the delayed addition of the coconut sugar, I followed everything exactly (using butter, not coconut oil) and it’s great! It makes quite a lot, too. Thank you! oh I love that you used real banana! I need to dehydrate more. And glad you liked it Jenn! I liked the idea…takes pretty good. Couldn’t find sugar free banana chips without breaking the bank tho. Mine doesn’t look like this–it’s very grainy because the coconut sugar didn’t melt or anything. Not sure it’s supposed to be like this? I used Ghee and a store brand unsweetened coconut. what type of sugar? Just coconut sugar? Could be the ghee. Large flaked coconut works best. Stir halfway though cooking time when it’s melting. Also, if the sugar is clumpy before adding it in, then be sure to break it up into a finer texture. Hope that helps! How lucky no can you keep it for and how should you store it? I’d store it in a ziplock bag or air tight container for up to 3 weeks. Or you can place it in the fridge for longer, no prob! This looks delicious! Sugar is on my restricted food list. Where did you find paleo chocolate chunks or chips? Can’t wait to try this recipe!! Thank you! Will this work doubled in a large crock pot? How about adding raisins or dried cherries or cranberries? I think so! but you might have to watch the cook times. Stir more frequently so it doesn’t burn. does that make sense? And raisins would be great! or dried cherries!